Even though we love cycling, sometimes (or in some places) riding in urban traffic isn’t very pleasant. The trams are ringing, the drivers are swerving… it makes you want to escape. But where to? The pavement of course! But is it really safer? You’d hardly find a cyclist who has never ever ridden on the pavement, even though it’s forbidden in most countries. Children cycle on the pavement because they are not allowed on the road before a certain age, and even if they were, they wouldn’t dare riding in the traffic. Adults opt for the pavement because it makes them feel less at risk. Nevertheless, riding on the pavement cuts both ways. While cyclists may feel safer, pedestrians are suddenly in great danger because they are slower than cyclists and thus more vulnerable. 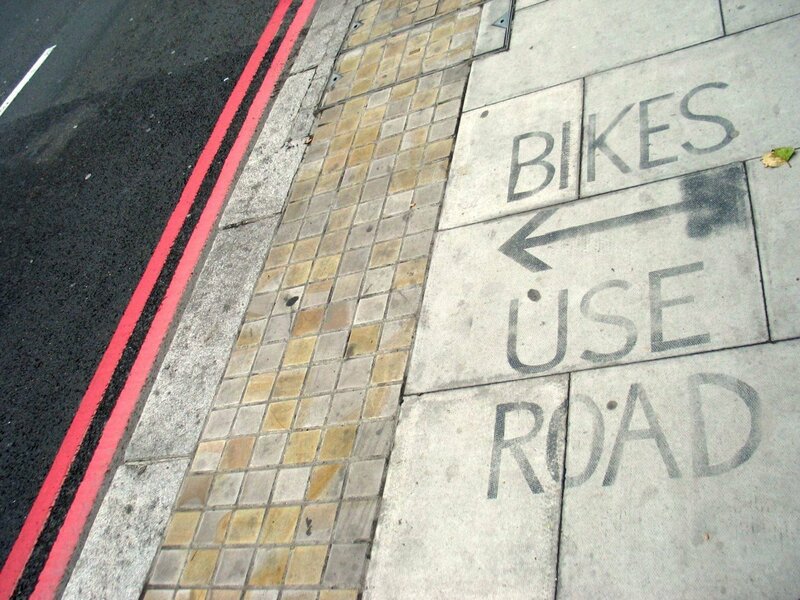 “It’s crucial to remember what a pavement is and what purpose it serves in the first place. The law is clear on this and has quite a straightforward set of rules for the use of the pavement,” says Jiří Polomis from BESIP, a Czech agency that aims to improve traffic safety. According to him, it’s important to take into account a significant factor known to all road users – the subjective feeling of safety. “From the cyclist’s standpoint, it’s definitely safer to ride on a deserted pavement in a place with heavy and complicated traffic. On the other hand, the pavement might not always be deserted, which may result in a clash between the cyclist’s and the pedestrian’s feelings of safety. This subsequently leads to mutual antipathy between the individuals involved in the situation,” Jiří Polomis explains. He further adds that another important reason for biking on the pavement is that the cyclist intuitively calculates their energy output. They will rather go 50 metres on the pavement than ride in compliance with the rules and make a 200-metre detour. Whatever the reason for biking on the pavement, it’s only legal in sections where it’s explicitly allowed. 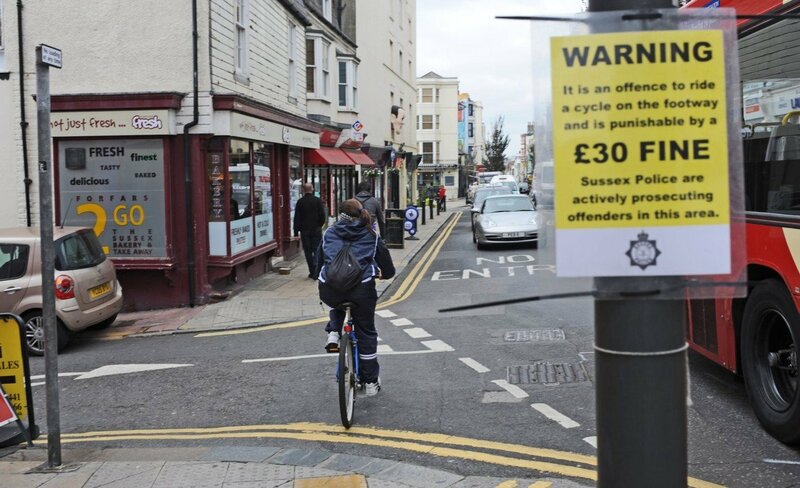 In all other cases, cycling on the pavement is forbidden, and the police are entitled to fine such behaviour according to the regulations of the respective country. In early 2017, the Metropolitan Police of London took an unusual approach to this phenomenon, when they decided to find out what makes cyclists violate the ban. They stopped the offenders, but instead of fining them on the spot, they asked the cyclists why they chose to ride on the pavement. This initiative helped identify extremely dangerous road sections in London, where for example parents didn’t dare to ride with their kids. 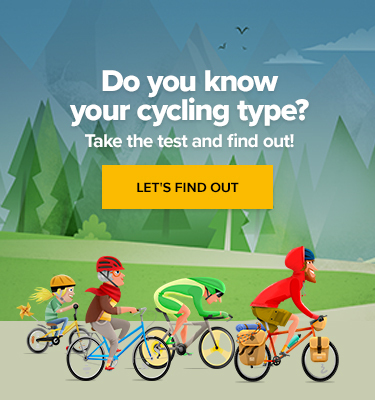 Who is most endangered by cyclists on pavements? First and foremost, it’s the blind and the deaf, who may have a hard time to orientate themselves among other pedestrians and who are definitely not ready to quickly react to a fast approaching vehicle, such as the bike. 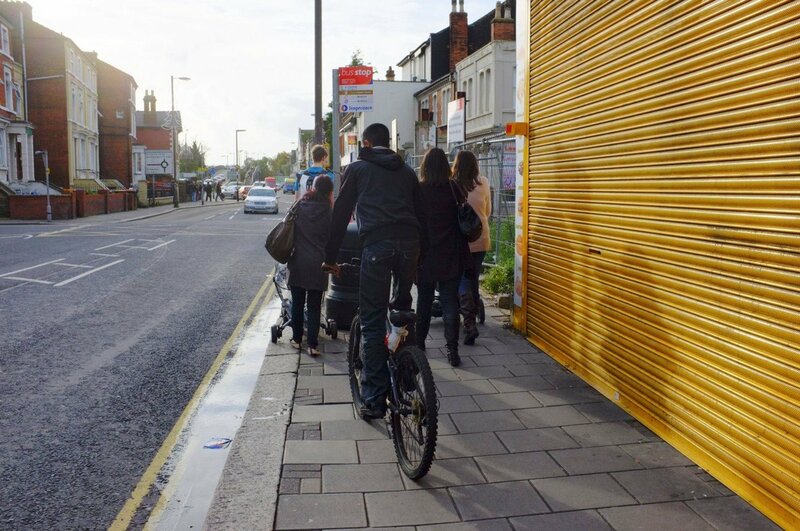 Forbidding cycling on the pavement is not an end in itself, it’s banned because it poses significant risks. When you cycle on the pavement, you risk that somebody who doesn’t expect your fast ride will get in your way, anywhere and anytime. So every metre you cycle on the pavement in a populated area may potentially result in a collision, which is definitely not worth it. Even though cyclists ride on the pavement mainly because they feel safer that way, lots of research contradicts this assumption. In 1998, Professor Lisa Aultman-Hall from the University of Vermont published a study featuring the testimonies and experience of 1,600 respondents living in Ottawa, Canada. Her research explored various aspects of the behaviour of cyclists in the city, and came up with an interesting finding: the number of cyclists who sustained an injury while riding on the pavement was four times higher than of those who got injured on the road. How is this possible? There are several reasons, the main reason being that in most cases cyclists don’t get hurt as a result of a collision with another road user, but because of their own doing: they fail to control the bike, lose their balance, go into a skid, underestimate their speed, collide with an obstacle, overlook a drain… simply put, they fall down. Moreover, cyclists who often ride on the pavement don’t have enough experience to venture into regular traffic. Aultman-Hall says that they lack the ability to correctly estimate things and the healthy confidence to bike with cars, which is the best way to come to harm. Regardless of all the studies and regulations, cyclists will never disappear from pavements for good. But there’s a big difference between aggressive cyclists who mistake the pavement for a cycle path, and those who adjust their pace to pedestrians, and don’t hesitate to get off their bike if they encounter a bigger bunch of people. “All in all, a solution to this situation would be mutual tolerance and respect to the law, encouraging people to respect legal standards,” says Jiří Polomis from BESIP, who thinks the best solution is prevention and raising public awareness. 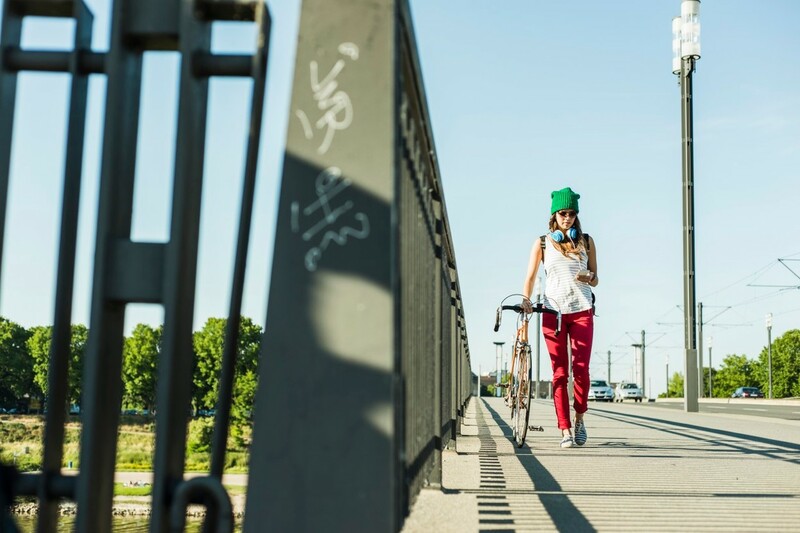 Another precaution that could be taken is related to cycling infrastructure: introducing separated lanes for cyclists that are isolated from other modes of transport, be it pedestrian or motorized traffic. “However, the most important thing will always be mutual respect and consideration for others,” Jiří Polomis concludes. What do you think? Is cycling on the pavement an unacceptable hazard to you or is it a sin you commit from time to time?